20,000 Leagues Under the Sea Exhibit Display of sets from the movie; located in Tomorrowland at Disneyland from August 3, 1955, to August 28, 1966. When Walt Disney was rushed to finish Disneyland on time, he fell behind on Tomorrowland. So, since the movie 20,000 Leagues Under the Sea was so successful, he decided to display the original sets there. The stopgap attraction turned out to be one of the more popular ones at Disneyland, so it remained for 11 years. The popularity of movie sets was proven again when Disney-MGM Studios opened in Florida in 1989. 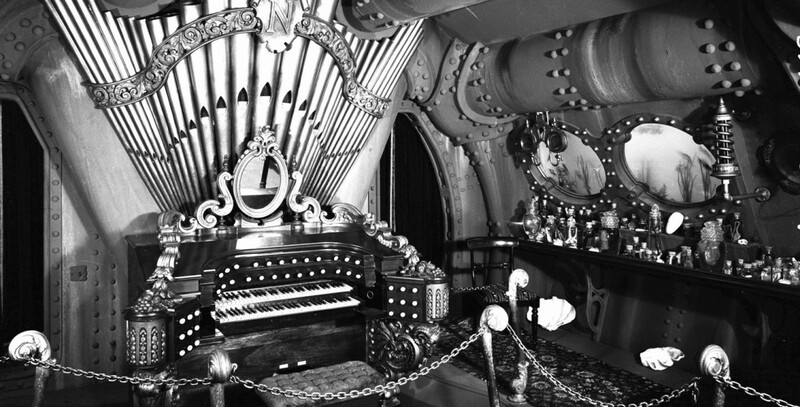 In 1994, Disneyland Paris opened a walk-through attraction, Les Mystères du Nautilus, similar to the one that had been at Disneyland, but this time most of the set pieces had to be reconstructed.